Basement floor: kitchens and catering rooms, dining room, 2 halls, “graffiti” hall, Medici gallery with glass door, 2 depots, 2 bathrooms, 2 closets, cellar, technical room. Connected apartment: 433 m2, two bedrooms, a lounge, a kitchen, a bathroom and two closets and two amenity rooms, independent entrance. General heating and cooling system. Keepers lodgings: 100 m2, four rooms and a cellar. Agricultural building A: 25 m2, 3 specialty areas for animal husbandry, small depot for agricultural tools and machinery, one bathroom. Agricultural building B: 64 m2, on one level, divided in two rooms with independent access. Agricultural building C: 77 m2, depot for agricultural tools and machinery. Tuscany – Florence: Florence 5 km - Lucca 40 km - Pisa 40 km - Siena 55 km - Forte dei Marmi 65 km - Monte Abetone 50 km - Montecatini Thermal Resort 20 km - Florence airport km 20. This beautiful historic villa, located on a scenic position, on one of the hill tops on the left side of the river Arno, a few kilometres from Florence, is now for sale. Its beautiful facade appears on the label of a wine that has made the history of Chianti Classico in the world: we are talking about Villa Antinori Monte Aguglioni, belonged to one of the great families of the Tuscan wine tradition from the late 19th century until the middle of last century. 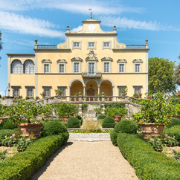 This beautiful villa, located just 5 kilometers from Florence, is rich in history. From 1498 to 1517 it was owned by the powerful Del Giocondo family who owned the famous Monna Lisa, wife of Francesco del Giocondo, called "La Gioconda," painted by Leonardo Da Vinci in circa 1505. From here it seems that Baldo was the Aguglione, jurist and Florentine politician, contemporary of Dante, who the great poet mentions twice in his Divine Comedy as the "villan of Aguglione." It was, in fact, the Aguglione to give judgment, September 2, 1311, which excluded Dante from the amnesty, preventing the return from exile. This is a rare complex from the 16th century, constituted by the manor house and other buildings of pertinence such as the keepers lodgings and other rural buildings of agricultural use. The property is surrounded by splendid parks and gardens, tree-lined alleys, vineyards and olive groves. A large wood surrounds and shelters this dreamlike property. There are two entrances: the main and original one is an iron double gate that allows access through a driveway, lined by cypress trees, that leads to the Italian style garden rich in ornamental plants and basins, which was originally designed by the English architect Cecil Pinsent, who created an actual park with rose beds, scented plants and symmetric flower beds. There is also a double ramp staircase leading to the main level. The main body of the villa, with a total floor space of 2800 m2, is constituted of three levels and a basement floor: on the ground floor, in correspondence with the loggia at entrance level, we find a grand entrance hallway, five halls, a large lounge, a corridor, a kitchen, a service entrance, two bathrooms, a closet and a technical room; in the basement there are three large rooms, a large gallery with access to the park, a kitchen, a dining room, two storage rooms, two bathrooms, three technical rooms and a cellar; on the first floor there are the sleeping quarters with five bedrooms one of which with a veranda decorated with stain glass and wrote iron, three walk-in wardrobes, five bathrooms, a fantastic library, a closet and a small balcony on the front face of the building; on the second floor there are two more bedrooms, a fitness room, a study, two bathrooms and a vast terrace called “dell’orologio” ( literally “the clock’s terrace”), that offers a spectacular view of the plane of the city of Florence. The floors connect to each other by a wonderful internal staircases but also by a practical elevator. Finally, on a mezzanine there are other areas that are used for staff. In this portion there are also other living spaces and rooms for agricultural equipment. An additional feature that adds value to this luxury property is the chapel, typical of prestigious period dwellings and a precious example of the devotional architecture of the 18th century. Among the many outbuildings we find the lemon conservatory, a second conservatory, a warehouse, technical rooms, the keeper’s lodgings and other rooms for agricultural use. The current decor of this luxury villa is of total prestige, with the façade featuring a large clock that was fixed on request of the Marquise Antinori in the early 1900’s, when the great works of restoration were directed by her brother , architect Egisto Fabbri, who was an artist and art collector. An ulterior added value to this period dwelling, rich in architectural and historic value, is the immediate proximity to the main Tuscan cities of San Gimignano, Siena, Pisa, Lucca and other localities like Chianti and the Tyrrhenian coast, all rich in artistic, architectural and natural beauty. Tuscany – Florence. Florence is universally recognized as a city of art, thanks to its incalculable storehouse of works, which transform the city’s streets and plazas into a vibrant open-air museum. The heart of Florence is Piazza della Signoria, dominated by the towering Palazzo Vecchio and the Galleria degli Uffizi. Just a few steps away is the Cathedral, where Brunelleschi’s superb cathedral is accompanied by Giotto’s bell tower and the Baptistery of St. John, with its celebrated bronze doors. The River Arno, which runs through the middle of the city, has played a role in Florentine history on a par with that of the city’s residents. Over the centuries, the people of Florence have maintained a love-hate relationship with the Arno, which has provided the city with both commercial advantage and disastrous floods. The most famous of the bridges crossing the river, the Ponte Vecchio, is adorned with jewelers shops housed in small cabins attached to the bridge, a construction technique found nowhere else in the world. Carrying Vasari’s noble corridor from one bank to the other, the Ponte Vecchio was also the only Florentine bridge to make it through the Second World War without suffering any damage. The left bank of the Arno, or the “Oltrarno”, is an area that still provides a feel, amidst its centuries-old crafts shops, of the Florence of yesteryear, as described by Vasco Pratolini and Marcello Vannucci. 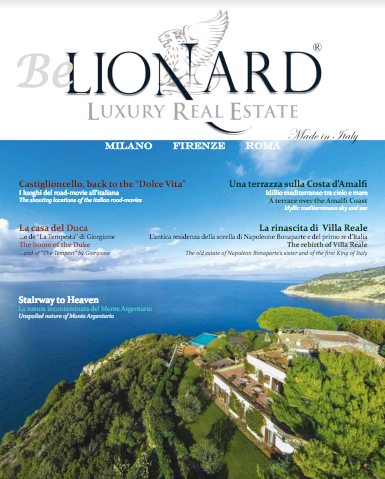 Typical Tuscan Estate For Sale, consisting of 8 Apartments for a total of 1,800 - M². This Property For Sale includes 161 acres of land and a Swimming Pool. Located on a hill immersed in nature this exclusive home in Tuscany boasts 1000m2 of built surface and a further 20.000m2 or gardens.